If you have moderately to severely active UC and are already taking SIMPONI®, you can share your video just like Greg did. For some people, starting a new treatment—and learning to self-inject—can be intimidating. If you've found success with SIMPONI® (golimumab), we'd like to hear your wisdom. Your experience might be just what others need to hear to inspire them on their own treatment journeys. Janssen Biotech, Inc., the maker of SIMPONI®, invites you to help inspire others by telling your story through the SHARE Network, a Janssen Global Services, LLC, program made up of volunteers dedicated to inspiring others through their personal health journeys and stories of caring. By participating in the Network, you may have the opportunity to share your story with Janssen employees, other patients and loved ones, or the general public. You choose which activities to participate in based on your comfort level, interests, and availability. To get started, fill out and submit the form below. A SHARE Network representative will reach out to finish your registration process and schedule a time to connect over the phone to learn more about you. Every position is optional, and you can share as much of your journey as you'd like. If your doctor decides that you or your caregiver can give your injections at home, you will need to be trained on the proper way to self-inject SIMPONI® directly under the skin. Once you've learned how to self-inject, you can do it at home without visiting the doctor's office. 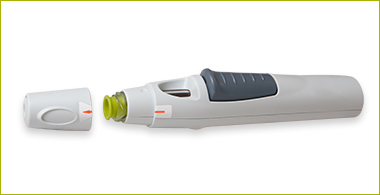 The SmartJect® autoinjector is specially designed to help you self-inject—without ever having to see the needle. The SmartJect® autoinjector has an easy-to-grip, oval-shaped body and a button on the side that takes only a simple squeeze to inject SIMPONI® under the skin. Once your doctor determines that you can self-inject using the SmartJect® autoinjector, you can take your SIMPONI® medication at home without having to travel to your doctor's office for your injection. 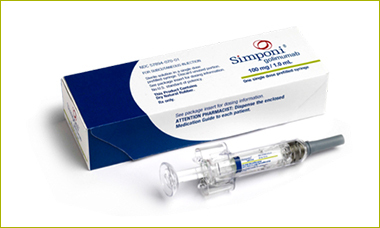 For those who prefer a prefilled syringe, SIMPONI® offers that choice, too. As with the SmartJect® autoinjector, you must learn to use it in your doctor's office and be taught by your doctor or another member of your healthcare team. The prefilled syringe, just like the SmartJect® autoinjector, provides the convenience of injecting on your own, in the comfort and privacy of your home. Please refer to the Medication Guide and Instructions for Use, included with your SIMPONI® medication, for more information on injecting with SIMPONI®. Biologic medications such as SIMPONI® require special handling, and specialty pharmacies have experience in managing these kinds of medications. For your convenience, the specialty pharmacy can have your SIMPONI® delivered directly to you. Or, if you prefer, your medication can be shipped to a treatment center — such as your doctor's office or a hospital— and you can pick it up yourself. If you have moderately to severely active ulcerative colitis (UC) and are corticosteroid dependent or have failed conventional therapy and are interested in SIMPONI®, or have made the decision with your doctor to start SIMPONI®, then the information below can be useful to you. Patients using Medicare, Medicaid, or other government-funded programs to pay for their medications are not eligible to participate. Terms expire at the end of each calendar year and may change. There is no income requirement. See full eligibility requirements. Having trouble paying for your medications? If you are using a government-funded healthcare program to pay for SIMPONI® or have no insurance coverage, Janssen CarePath can provide information about other resources that may be able to help with your out-of-pocket medication costs. Call a Janssen CarePath Care Coordinator at 877-CarePath (877‑227‑3728), Monday – Friday, 8:00 AM – 8:00 PM ET. Or visit JanssenPrescriptionAssistance.com for information on affordability programs that may help with your SIMPONI® medication costs. No matter what type of insurance you have—or even if you don't have insurance—Janssen CarePath can help explain your medication insurance coverage and benefits, and help find programs that may help you pay for SIMPONI®. Additional support is available to help you during your treatment with SIMPONI®. Through Janssen CarePath, you can get medication reminders and use Safe Returns®, a simple and safe way to dispose of your used injection devices—at no additional cost to you. Even after you’ve been trained by a healthcare professional to give yourself an injection, you may still have questions. Janssen Nurse Support* can help answer questions about giving yourself an injection at home. Connect with Janssen Nurse Support at 877-CarePath (877-227-3728), available Monday – Friday, 9:00 AM – 8:00 PM ET. *Janssen Nurse Support is limited to education for patients about their Janssen therapy, its administration, and/or their disease, and is not intended to provide medical advice, replace a treatment plan from the patient's doctor or nurse, or provide case management services. Call a Janssen CarePath Care Coordinator at 877-CarePath (877-227-3728) Monday – Friday, 8 AM – 8 PM ET. Multilingual phone support available. Visit JanssenCarePath.com. I give my permission for SHARE Network staff to leave a message on my voice mail.